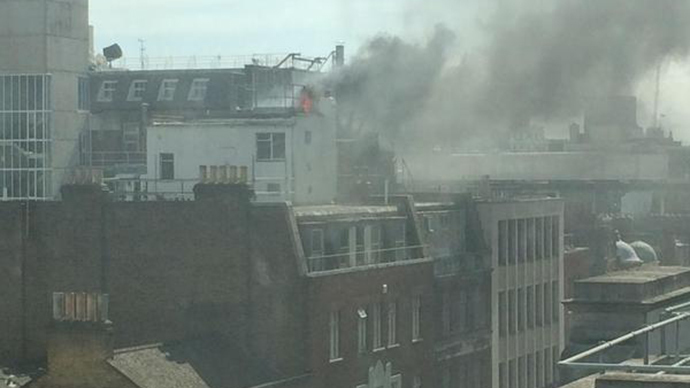 A huge fire has broken out on the roof of a building in central London, a short distance from the BBC’s headquarters. Alarmed workers in the area shared images of the “thick black smoke” fogging the streets of London on social media. Twenty firefighters were called to the scene at 12.22pm to tackle the flames spreading on the rooftop over Great Portland Street. The London Fire Brigade said the fire was in the elevator motor room of a building that was being refurbished. However, they recently confirmed on Twitter they had put the fire out quickly.